Asteroid Valentine 447 is your love nature and asteroid amor 1221 is love itself. For example, when you speak of Valentine it is about how you express your love, the house tells you how you love. While Amor is your love and expectation in love. When asteroid Valentine 447 is in aries, fifth house it means that in love you play the saviour and your love is royal. Or you play the saviour thinking your lover to be a royalty or a star. Sometimes, you can actually become the saviour of a star or royalty whom you take as your lover. Your love story is a saviour's dramatic love story. On the contrary, Amor in aries, fifth house means that you are the warrior in love with a childish lover with whom you can have fun. A love story of a warrior and the young princess or vice versa. Sign (Your nature)+ House (Your Lover)= Your love story or couple story or love. Valentine in Aries: You are the saviour, knight in shining armour, decisive, leader and go-getter in love. You attract for your macho attitude, saviour, leadership and fighting qualities. Valentine in Taurus: You are the banker, stubborn, sensualist, materialist, security provider in love. You attract for your money, sensuality and beauty. Valentine in Gemini: You are the poet, musician, communicator and talkative in love. You attract for your communication and musical abilities. Valentine in Cancer: You are the mother, nurturer, comforter, safe haven provider in love. You attract for your comforting, feminine (for women), sensitivity and protective qualities. Valentine in Leo: You are the royalty, star, childish, fun loving and creative one in love. You attract for your dramatic personality, pride, masculinity (men) and stage presence. 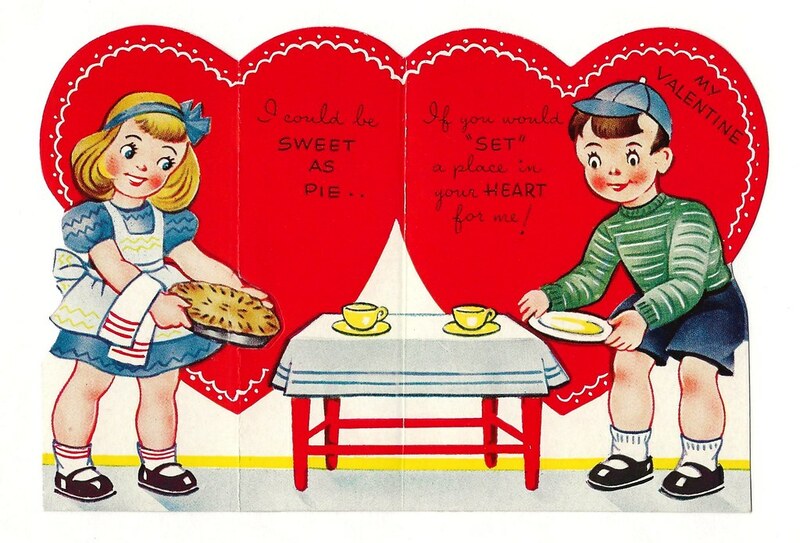 Valentine in Virgo: You are the employee, caretaker, nurse, doctor, subservient one in love. You attract for your healing and devoted nature. Valentine in Libra: You are the beauty conscious, fashionable, confused, lawyer, fair judge and diplomatic one in love. You attract for your peace-making, commitment and fashion-ability. Valentine in Scorpio: You are the obsessive, possessive, tantric, deeply passionate, control freak in love. You attract for your depth, passion and powerful magnetism. Valentine Sagittarius: You are the educated, religious minded, adventurous, traveler, gypsy, teacher in love. You attract for your knowledge, adventurous attitude, travel enthusiasm, religious ideology, teaching capabilities, expansiveness, sports talent and speed. Valentine in Capricorn: You are the serious, non- demonstrative, patriarch, ceo, image conscious, ambitious one in love. You attract for your position, status, dependability and seriousness. Valentine in Aquarius: You are the friend, unpredictable, scientist, group activist, humanitarian and eccentric one in love. You attract for your friendliness, sociability, unpredictability and rebelliousness. Valentine in Pisces: You are the dreamy, artistic, spiritual, illusionist, imaginative, clandestine and divine one in love. You attract for your dreamy auric charm, selflessness, artistic qualities and elusiveness. Asteroid Valentine is related to love. Therefore, as it attracts, it can attract staunch opposition as well as lovers. There is no without opposition or challenges to overcome. All great love stories are revolve around the same theme. Valentine in 1st house: Your love style is that of warrior, aggressive, action-oriented, egoistical, saviour and military leader. You chase your love interest and attract damsels in distress. Valentine in 2nd house: Your love style is that of sensualist, money conscious, wealthy person, someone who spends money on beauty and possessions. You attract your love interest through your money, beauty and sensual nature. Valentine in 3rd house: Your love style is that of communicator, pr, musician, poet and talkative. You attract your love interest through your communication, mediation, music and poetry. Valentine in 4th house: Your love style is comforting, nurturing, emotional, mothering, sensitive and protective. You attract your love interest through your comforting, nurturing, mothering, emotional sensitivity and protectiveness. Valentine in 5th house: Your love style is highly romantic, dramatic, fun, child-like, graceful, proud, famous, bold, generous and attention-seeking. You attract your love interest through your personality, dramatic, proud, bold, attention-seeking, child-like and generous attitude. Valentine in 6th house: Your love style is subtle, devoted, dedicated, routine, sub-subservient, workaholic, accounting, exacting, hygiene loving and nursing. You attract through your dedication, methodical, routine, hygiene loving, healing and nursing attitude. Valentine in 7th house: Your love style is indecisive, peace-loving, frequently changing, commitment seeking, based on equality and fashion-loving. You attract through your fashion sense, peace-making, fair attitude, eagerness to bond on a permanent basis and aesthetic sense. Valentine in 8th house: Your love style is intensely deep, highly passionate, tantric, secretive, gut-wrenching, magnetic, powerful, taboo, trans-formative and involving deadly themes. You attract through your intensity, passion, powerful magnetism, taboo, tantric sexiness, secretive and deadly gut-wrenching heat. Valentine in 9th house: Your love style is expansive, adventurous, courageous, learning, knowledge-thirsty, teaching, religious minded and sporting. You attract through your enthusiasm, optimism, liveliness, grasp on various subjects, your profound detailed education, teaching abilities , sports talent and religious mastery. Valentine in 10th house: Your love style is non-demonstrative, cold, dry, serious, lacking romance, non-enthusiastic, patriarchal, status conscious, public, position conscious, corporate, stern and dependable. You attract through your seriousness, position, patriarchy, influence and dependability. 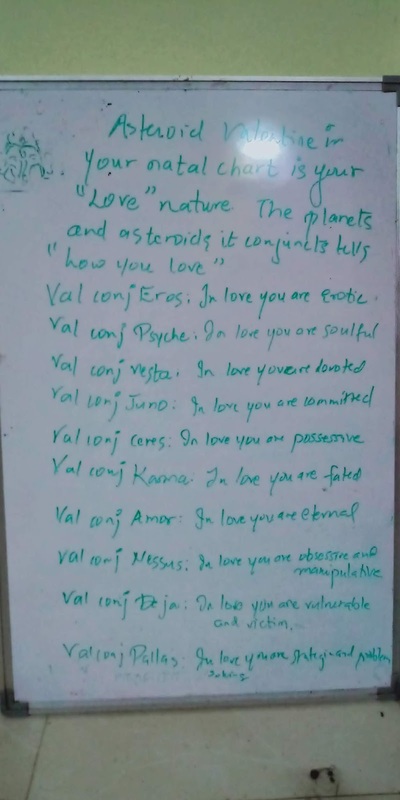 Valentine in 11th house: Your love style is friendly, unpredictable, scientific, research oriented, weird, unique, eccentric, group-based, humanitarian and detached. You attract through your rebelliousness, unpredictability, friendliness, sociability and humanitarian attitude. Valentine in 12th house: Your love style is unworldly, imaginative, midsummer's night dreamlike, enchanting, spiritual, psychic, artistic, highly sensitive, pious and selfless. You attract through your dreamlike, enchanting, spiritual, artistic, graceful and selflessness. Valentine in Composite charts reveals the state of the relationship in easy to understand codes. When Valentine is opposed by many planets then you can understand that the relationship will face many obstacles. A composite Valentine conjunct Pluto can be very troublesome creating powerful enemies that can use beg, borrow or steal attitude to hurt the pair. 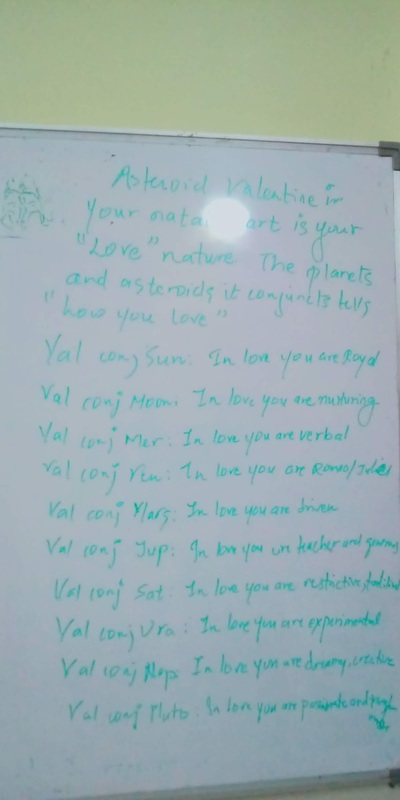 It is also important to see personal planet relationship with the composite valentine.